With The Collapse Of The ISIS 'Caliphate,' A Camera Lens Lingers On Those Left Behind : The Picture Show As U.S.-backed forces fought in recent weeks to reclaim the last territory held by ISIS in Syria, photographer Felipe Dana turned his lens on the thousands of civilians rushing to evacuate. Women and children evacuated out of the last territory held by Islamic State militants wait to be screened by U.S.-backed Syrian Democratic Forces (SDF) in the desert outside Baghouz, Syria, on Feb. 27. Felipe Dana has spent more than two years photographing the fight against ISIS in Iraq and Syria, but he says he's shot his most compelling work in just the past several weeks. 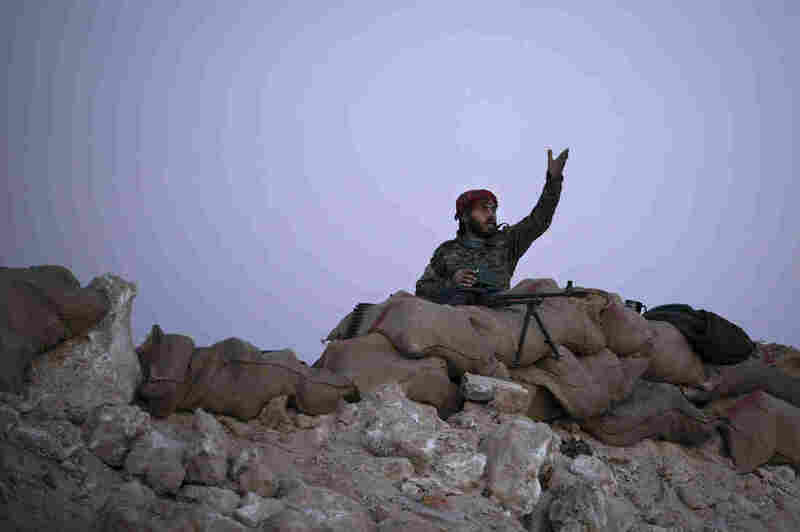 The Syrian Democratic Forces, a Kurdish-led group backed by the United States, announced this week that it had captured Baghouz, what's believed to have been the last territory held by Islamic State militants. "Some days we saw over 4,000 people being evacuated out of this tiny village in Syria," Dana says in an interview with Michel Martin for NPR's All Things Considered. "They didn't expect to have this many people there at all ... They were coming out of tunnels and makeshift tents." 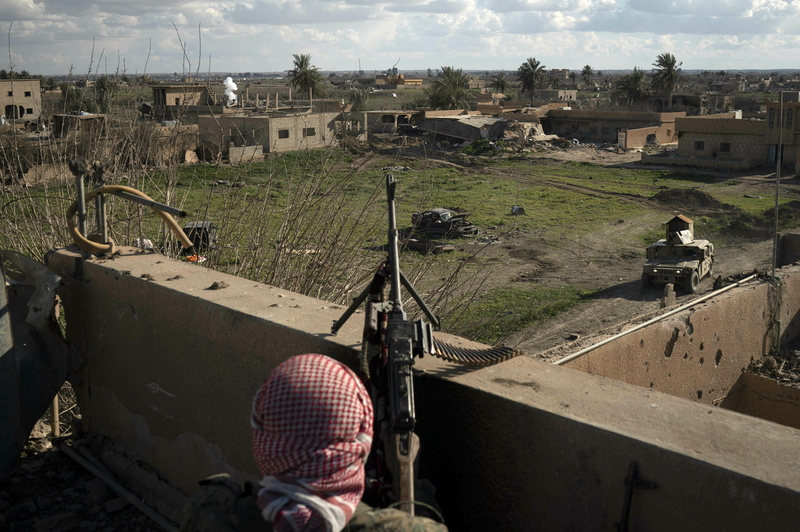 A fighter with the SDF stands atop a building used as a temporary base near some of the last land held by Islamic State militants in Baghouz, on Feb. 18. 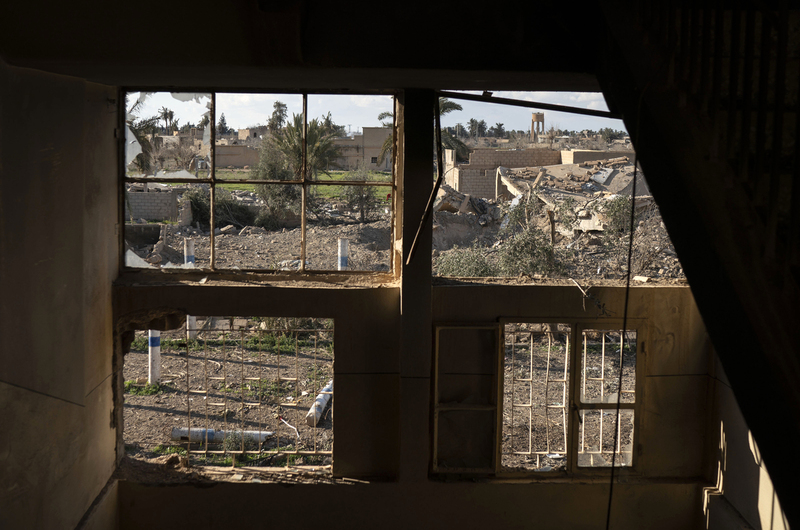 Destroyed homes are framed by damaged windows in a building taken by Syrian Democratic Forces in Baghouz, on Feb. 18. 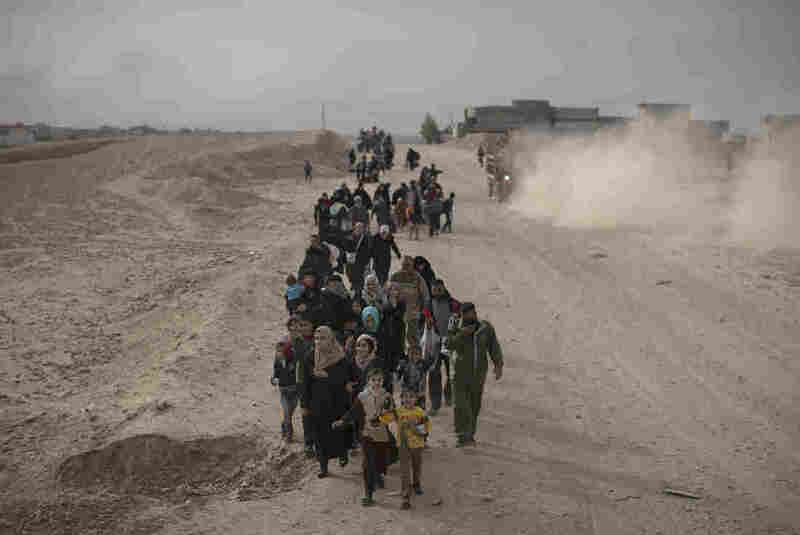 In November 2016, internally displaced people flee fighting between Iraqi forces and Islamic State militants on a road in eastern Mosul, Iraq. 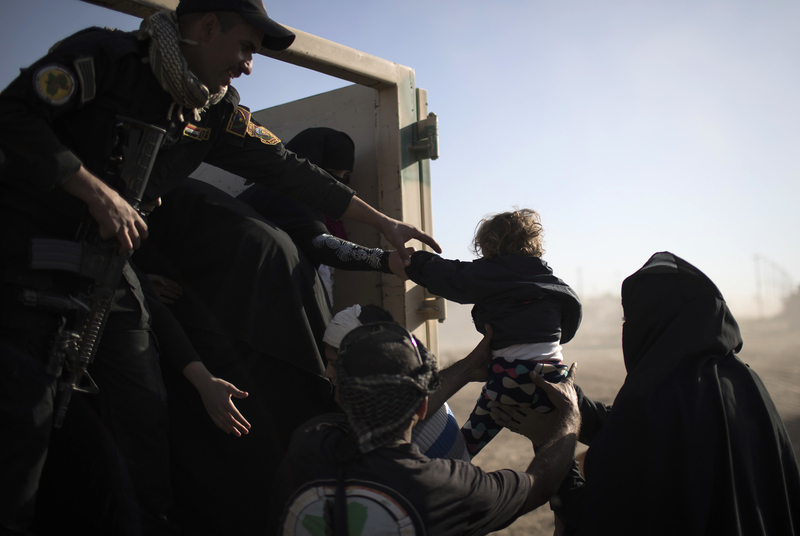 In November 2016, a baby displaced by fighting between Iraqi forces and Islamic state militants is carried into the back of a truck before leaving Mosul, Iraq. 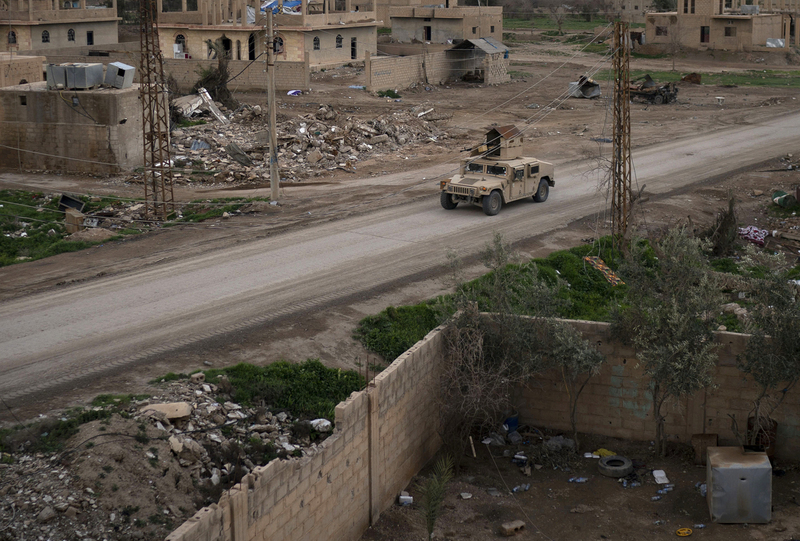 A Humvee drives in a village recently retaken from Islamic State militants by U.S.-backed Syrian Democratic Forces (SDF) near Baghouz, on Feb. 17. The collapse of ISIS's self-declared caliphate marks a dramatic reversal for the extremist group, which at one point controlled a swath of territory in Syria and Iraq that rivaled the size of Great Britain. That territory included major cities like Mosul, Iraq and Raqqa, Syria, with combined populations in the millions. Dana says what happens next will be pivotal in terms of the future of the area's civilian population — especially for the women and children who are often the subject of his photographs. "The amount of women and children being evacuated from these areas is insane," he says. "We're talking about tens of thousands of people and they're all being taken to camps." 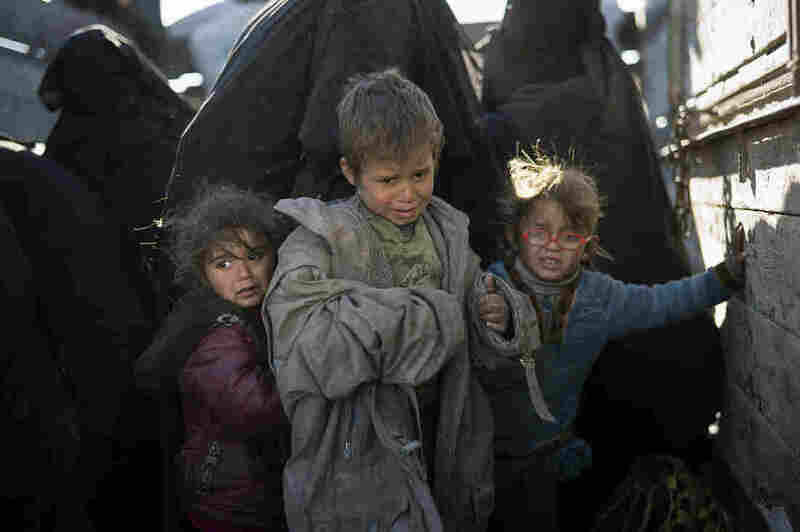 ... About 1,800 women and children from Europe and elsewhere are languishing in detention camps in northeastern Syria. Their countries are hesitant to take them back home because the authorities don't know what to do with them. ... Advocates of those detained say their home countries have a responsibility to take them back and either prosecute them or release them. They also say that letting them languish endlessly in camps just breeds more radicalism. 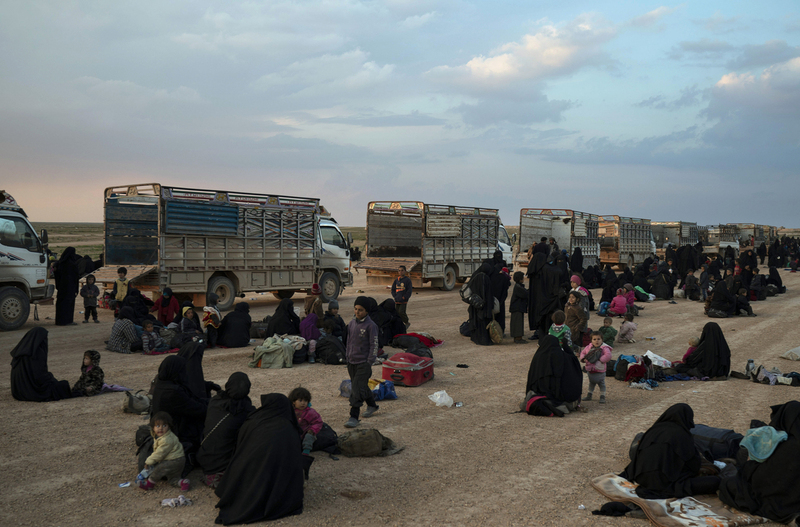 Women and children exit the back of a truck as they arrive to a SDF screening area after being evacuated out of Islamic State territory in the desert outside Baghouz, Syria. 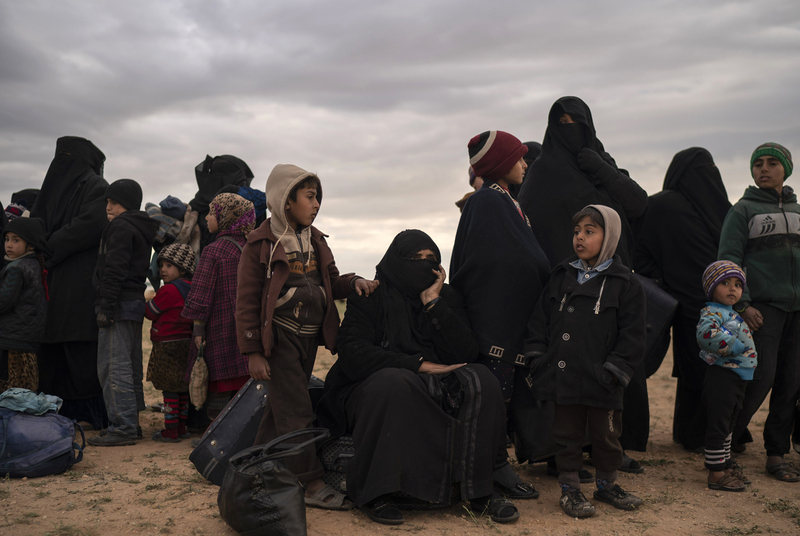 Women and children wait to be screened after being evacuated out of ISIS territory near Baghouz, eastern Syria,on Feb 22. The president's declaration is "mostly symbolic," he says. "I think ISIS lost their territory and this is a very big thing. But it's definitely not over." 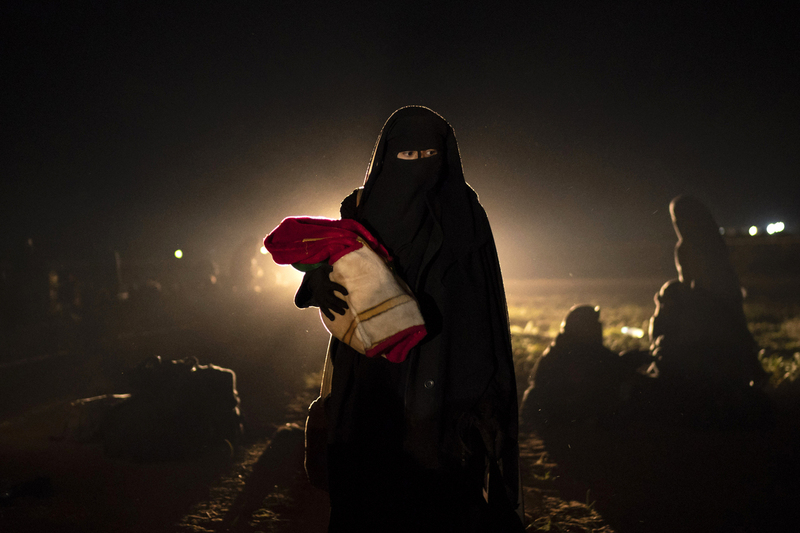 A woman who was evacuated out of Islamic State territory holds her baby after being screened by SDF forces in the desert outside Baghouz, Syria, Feb. 25. 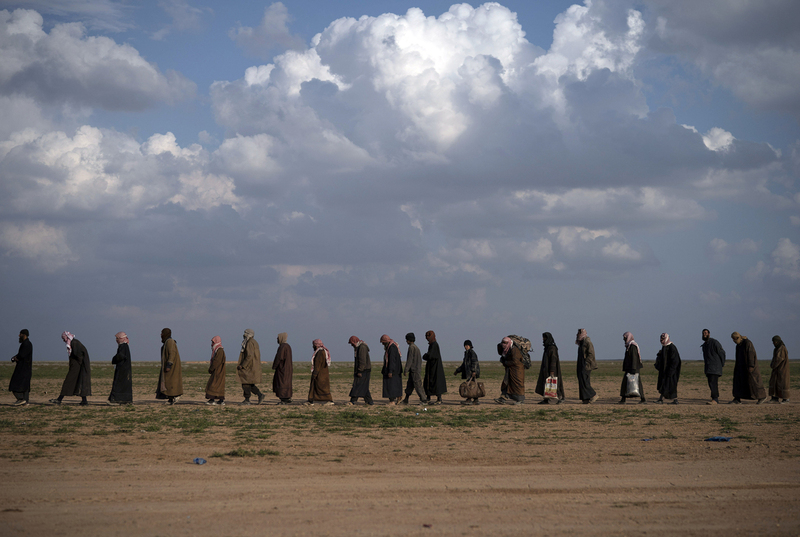 While the capture of Baghouz marks the end of the ISIS caliphate, thousands of fighters remain in Syria and Iraq – some 14,000 according to the National Counterterrorism Center, as NPR reported on Friday. Elsewhere, the group's ideology holds power. As civilians return to liberated territories like Baghouz, Dana is wary of a resurgence. "Although the territory is not controlled by ISIS anymore and there is a presence of SDF forces, these forces on the ground are being attacked by ISIS sleeper cells and or militants there returning," he says. A U.S.-backed Syrian Democratic Forces (SDF) fighter reacts as an airstrike hits territory still held by Islamic State militants in the desert outside Baghouz, Syria, Feb. 19. 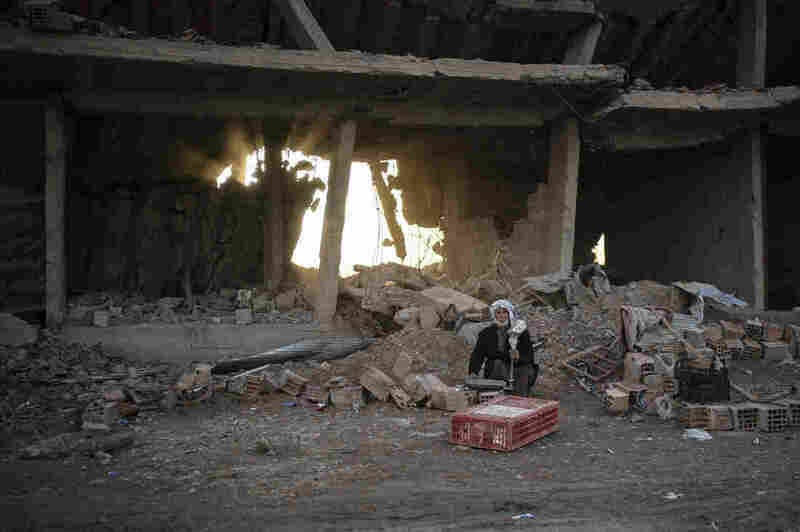 A man selling chicken sits in an area recently retaken by the Syrian Democratic Forces in Hajin, Syria, Feb. 16. NPR's Robert Baldwin III produced the audio version of this story.